Blyth Spartans suffered defeat in a nine-goal thriller at Aggborough on Saturday as Alun Armstrong’s men went down 5-4 at the hands of Kidderminster Harriers. The hosts took the lead through Andre Brown. Dale Hopson restored parity before David McTiernan put the Spartans into the lead. James Pearson responded before McTiernan to put the visitors 3-2 ahead at the interval. The second half was almost as entertaining. Emmanuel Sonupe, James Pearson and Andre Wright all added to Kidderminster’s tally. Dale Hopson pulled a goal back but it wasn’t enough to salvage a share of the points. The Harriers started the game on the front foot and took the lead through the first attack after four minutes when Brown found the corner of the net. The visitors found themselves struggling, but out of nothing, Blyth were level after 17 minutes. Dan Maguire fed Dale Hopson, who kept his composure to round Brandon Hall in the Kidderminster net and slot home. Two minutes later and Spartans were ahead. A corner was headed away by Kidderminster but it only reached the edge of the box where McTiernan volleyed it superbly into the far corner of the net. Kidderminster were on the ropes, but they responded with a headed equaliser from Pearson. In what was turning into a cracking game, McTiernan put Blyth 3-2 in front at half-time with a stooping header. On 56 minutes, Kidderminster drew level at 3-3 when Sonupe was adjudged to have been brought down in the box and he picked himself up to send Jameson the wrong way from the spot. As in the first half, one goal was quickly followed by another and it again went the way of the home team. A corner from the right was met by the head of the onrushing Pearson who doubled his tally. 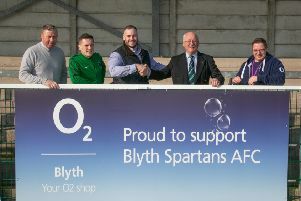 Blyth threatened to get back on level terms but, on 75 minutes, the home side added a fifth when Wright guided the ball over Jameson and off the underside of the bar. With five minutes of the game remaining, Spartans grabbed a lifeline when Hopson forced the ball home, but there was no time for an equaliser. Next home game is against Nuneaton on October 7.